PrattMWP Admissions: Simple Process. Friendly Staff. A World of Opportunity. Applying to PrattMWP is easy! In fact, you will find that every aspect of the application, enrollment, and payment processes is quick and simple. Here are some of the basics. You may check your status online to see which materials we have received and which are outstanding. You will need to enter your email address and the password you created when you submitted your application. Please note that it can take up to three weeks for documents you recently sent to display as received on the checklist. If your documents do not show as received and you sent them within the past two weeks, please do not worry, and continue to check back. Note that letters of reference will not show on the checklist as they are not required. One of the many reasons students choose PrattMWP is that it is a more cost-effective option for many students. Tuition at PrattMWP is $32,210 year, a substantial savings compared with Pratt Institute’s Brooklyn campus tuition of $50,038. PrattMWP's curriculum is the same as Pratt's Institute's prestigious curriculum for the first two years, ensuring a world-class education and a seamless transition. How likely is it that I will qualify for financial aid? Very likely! PrattMWP offers several types of financial assistance including generous scholarships, grants and other forms of financial aid. About 96% of PrattMWP students receive financial aid and 81% receive merit-based scholarships. All accepted students are automatically considered for PrattMWP's scholarships, up to half tuition, with no separate application required. Students who relocate to Brooklyn are considered for generous scholarships as well. We urge you to contact financial aid today to discuss your options. You may email Brenda Taylor. All applicants are required to submit a visual portfolio. 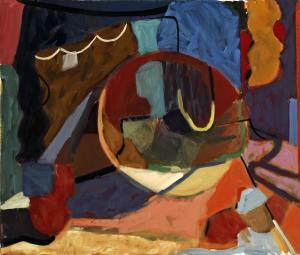 Your portfolio must be submitted at www.pratt.slideroom.com and should be a visual presentation representing your art and design experience and accomplishments. Read about portfolio requirements. We encourage students to participate in an in-person portfolio review, although portfolio reviews are not required for admission. They are simply to give you advice and feedback on your work before applying. They are offered in the admissions office and throughout the country in the fall at National and Regional Portfolio Days in your area. 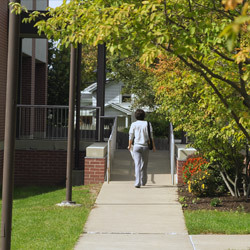 On-campus housing is available in our freshman and sophomore residence halls. Rooms are spacious and are furnished with a kitchenette and full-size refrigerator, private bathroom, living room, and bedroom. Housing is guaranteed for all students who deposit by May 1. I’m an international student. What do I need to know? Students travel to Utica, New York, from many countries to attend PrattMWP. In fact, 25 percent of the incoming student enrollment is international. PrattMWP provides a wide variety of services including English classes to help you adjust to your new educational, cultural, and social environment. Review our requirements, request a catalog, or schedule a visit below. 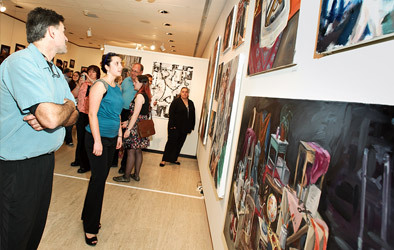 PrattMWP College of Art and Design in Utica, New York, is the upstate NY extension campus of the world-renowned Pratt Institute, located in Brooklyn, New York. 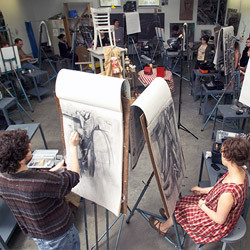 PrattMWP offers the first two years of Pratt Institute’s four-year BFA in an intimate and nurturing environment with small class sizes, ensuring individualized attention from professors who are all professional artists and designers, and a substantially lower tuition with generous merit-based scholarships. After you complete the first two years at PrattMWP, you seamlessly and automatically relocate to Pratt Institute’s main campus in Brooklyn as a junior to complete the last two years of the BFA program; no application is required to relocate. Upon graduation, you are awarded your degree by Pratt Institute and become part of a prestigious community of talented Pratt alumni. 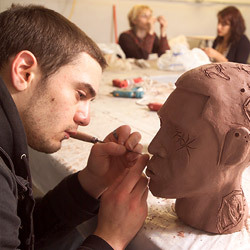 Although 95 percent of students choose to relocate to Pratt’s main campus to complete their degree, you may also apply to any other art and design school as a transfer student.